Too Many Thoughts: What's in your bag? 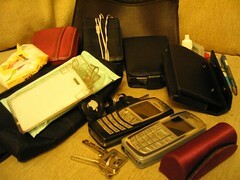 As earlier mentioned, the image for the "What's in your bag?" Flickr photo pool. Click on the image to see detailed notes. The inventory's grown since I last blogged about it. Carries a messenger bag, backpack or some other carry-all of equivalent size. Is armed with, beyond the typical wallet and keys, a cellphone, an iPod, a digital camera, of course, and probably a laptop, in all likelihood a Mac. May in fact be a photographer who hauls around any number of cameras and lenses with him all day, everyday. Has a job either requiring a security pass or, conversely, that's of a creative and casual/freelance nature, where they carry everything they need for work around on their person. Enjoys cataloguing such personal minutiae with witty comments. Ah, Flickr users. Such hipsters, we are. Nice, nice. Maybe I should do one too but the thing is, I seldom carry a bag around.